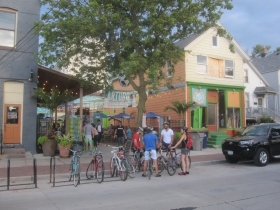 401 E. Brady St.; 1668 N. Warren Ave.; 1672 N. Warren Ave., City of Milwaukee. Assessed for $648,000. Recently sold for $1,750,000. Photo by Michael Horne. 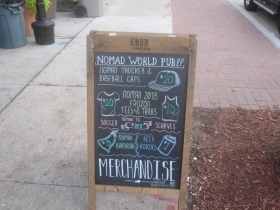 The Nomad World Pub, 1401-03 E. Brady Street, occupies a 1,187-square-foot 1880s building that takes up every inch of its lot, including the addresses of 1668 N. Warren Ave. and 1672 N. Warren Ave. 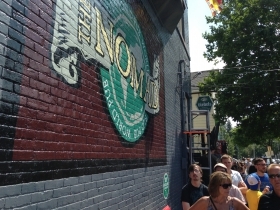 The Nomad opened in 1995, when Mike Eitel used his world travels as a theme for the tavern he leased from Julilly Kohler. The place had boarded up windows and was rather desolate for decades, as was a good share of the clientele. Eitel opened up the windows, cleaned up the interior, and eventually bought the place. 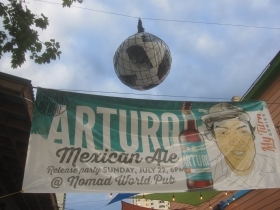 In 2018 the business expanded to the north in a beer garden that is popular during the summer months, especially if there is a soccer match being televised from somewhere — anywhere — in the world. 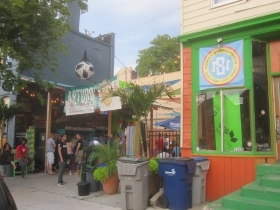 Such expansions of the bar’s footprint resulted in the Nomad also incorporating the addresses of 1668 N. Warren Ave. and 1672 N. Warren Ave.
Pias must see a rosy future for Brady Street, since he paid a million-dollar premium to the property’s assessed valuation with a sale price of $1,750,000. But the sale comes with an important intangible asset beyond the bricks and mortar in the form of a 30-year lease with Nomadic Ventures, LLC., the company Eitel uses to operate the business, which will remain the sole tenant of the property. Bankers and real estate investors know how to capitalize on these things. Eitel is essentially getting his equity and then some paid in a lump sum, which Pias will recoup (and then some) over the next three decades of lease payments. It’s more like an annuity than a real estate deal in some respects. Will other Brady Street properties draw such a premium to their valuations? Or is this an outlier due to its numerous attributes and established tenant? In any event, this sale was one of the most remarkable to be announced this year. 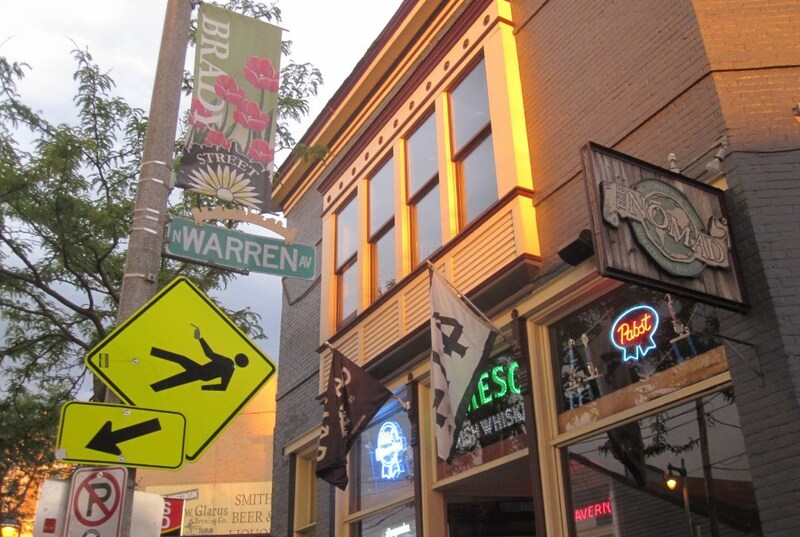 Location: 1401-03 E. Brady St., 1668 N. Warren Ave., 1672 N. Warren Ave. Description: Two homes, front and rear, located to the south of the corner tavern on E. Brady St. have been razed and replaced with an outdoor patio, beer garden complete with kitchen, brand spanking new restrooms, walk-in cooler and concession stand. Property Assessment: The combined properties are valued at $201,600 ($21.73/s.f.) and the aggregate improvements are valued at $446,500 for a total assessed valuation of $648,000. Property sold for $1,750,000 in March 2019. 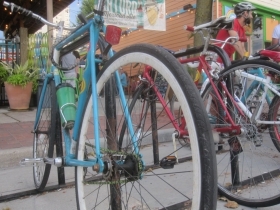 Operator, Nomadic Ventures LLC has 30-year lease on property. Urban Milwaukee Nomad World Pub Expansion Plans Approved, Jeramey Jannene December 13th, 2016.